Poles' protest against official Warsaw’s support for Ukraine is scheduled for April 10 in Krakow. WASHINGTON (Sputnik) — Thousands of Poles will voice their disapproval of Warsaw’s support for Ukraine and draw attention to the issue of neo-Nazism at a protest scheduled next week in Krakow, protest organizer Mlodzi Malopolscy Patrioci told Sputnik on Monday. The protest is scheduled for April 10, and will be held in front of Ukraine's Consulate General in Krakow. More than 5,000 people are planning to participate in the event, according to the rally’s webpage. The protest comes as Polish Foreign Minister Grzegorz Schetyna announced earlier in March 2015 that the Polish military will provide training to Ukrainian troops as part of a NATO program. Polish Defense Minister Tomasz Siemoniak also said earlier in March that the Warsaw authorities hope NATO will expand its military presence in Poland, despite Moscow’s repeatedly expressed concern over the build-up of NATO forces next to its territory. The rally in Krakow will also try to bring attention to the problem of rising neo-Nazism in Ukraine. “We do not approve Nazism and communism. 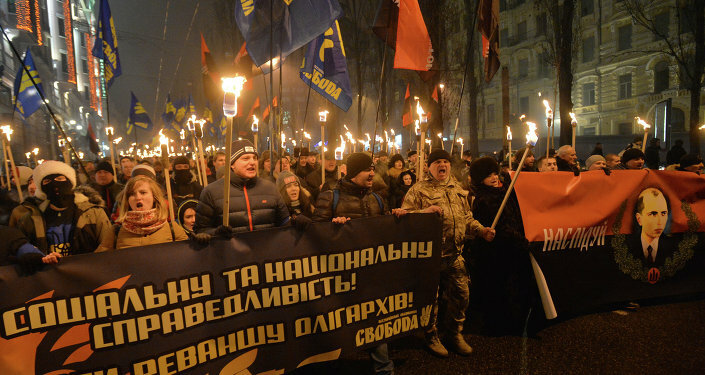 We've seen, for example march for the glory of Stepan Bandera and the rest of Ukrainian Partisan Army, and we've seen photos of the Ukrainian soldiers with Third Reich flags,” Mlodzi Malopolscy Patrioci stated. Pro-Kiev volunteer far-right battalions, such as the Donbas, Azov and Dnepr, were formed in April 2014 after the government launched a military operation against independence supporters in Southeastern Ukraine. In November 2014, the volunteer battalions were put under the command of the Ukrainian Army. International watchdogs, including Human Rights Watch, have repeatedly expressed concerns over crimes against civilians committed by Ukrainian battalions. Amnesty International said in September 2014 that the Ukrainian government is responsible for the war crimes and human rights violations committed by volunteers.